Poet Jen Jabaily-Blackburn: The funny thing about this poem is that I originally wrote it as a response to the art featured in your Switcheroo contest (see the April 2012 Switcheroo art by Cheryl Gross), and I incorporated some of the odder, more vivid details in that work (the wheels for feet, the vents in the human figure’s head, the animal that I’ve assumed is a Tibetan Mastiff) into this poem and pointed to them as if they were perfectly usual things to expect/impose in the poem’s world. Outside of that, I thought the artist might pick up on the material excess of the poem. Artist Kara Searcy: The line “workers still complain how dreams struggle inside their heads” was a large part of what pushed me towards a painting that seemed to hide something beautiful. The music notes are meant to represent things/dreams pent up inside; having no real way of release, they begin to show through whatever is containing them. Poet Jen Jabaily-Blackburn: Yes! I think it’s a much moodier piece when matched with Kara’s work. I love how the buildings have this weird otherworldly color against the grey background, and seeing that the buildings are made of sheet music, that’s just gorgeous—a glimpse of almost invisible music. When I wrote this, I was thinking quite a bit about the idea of corporate personhood, and Mitt Romney’s ridiculous “Corporations are people, my friend” was making the rounds again, and I wondered what sort of privileged, out of touch childhood/education a corporate person would have to have. It’s a funny poem to me, but also very frustrated. I just hope the whole thing doesn’t read as broadly comic. In the end, I think the art tapped into that undercurrent of frustration that I really hoped would come through some deceptively silly lines. Artist Kara Searcy: When I started layering was what I focused most intently on. With acrylic paint layering is almost always a given, but because of the written content I appreciated being able to see those layers more clearly because it gives the painting a “rough around the edges” look, which to me, reflects the writing. Poet Jen Jabaily-Blackburn: I worried about having no control over the visual aspect of the poem’s interpretation (poetry can bring out the worst micro-manager in me). I also had to accept that I’d have no way to influence the outcome outside of the poem itself. Collaborating like this is like playing a game of “Telephone” in a way—you have to hope that your idea gets through intact. I think it did! Artist Kara Searcy: I was surprised by how busy the piece looked. Poet Jen Jabaily-Blackburn: Yes, I do it frequently, though it’s usually in a very formalized kind of way, i.e. seeing a work in a gallery and finding I don’t want to move on from it, and getting it stuck in my head, wondering why I respond to that particular piece, but not others… I grew up near Boston and loved (still love) going to the MFA, and I’ve written a poem on Copley’s “Watson and the Shark,” a painting I still find terrifying and fascinating. I’m sure there are others who’ve passed that same painting by and didn’t really care, or maybe had a momentary fascination with it that faded…for me, that one got lodged in there permanently. If you had to represent the Broadsided of “Dear Corporation, Early Years to Present” with one word, what would it be? 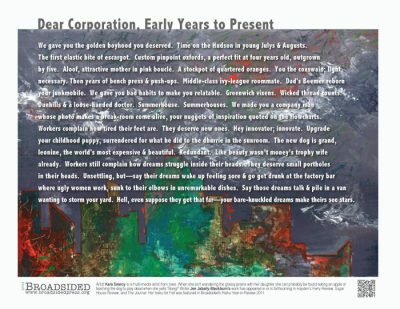 If “Dear Corporation, Early Years to Present” were a piece of music, what would it be? Poet Jen Jabaily-Blackburn: I worry that David Ferry’s Bewilderment might have ruined all other books for me forever. I finished it over the weekend, and I can’t stop thinking about it. I took tons of Classics courses as an undergrad; Virgil (and Ovid, and Homer) are so much a part of my brain that they don’t seem out of place in our time in any case, but to see Ferry take his own translations of the classics and apply them in no small way to his experience, it’s brilliant. But, yeah, there are others I’ve really liked, too: Katherine Larson’s Radial Symmetry, Ashley Anna McHugh’s Into These Knots, Johnathon Williams’s The Road to Happiness and Suzanne Buffam’s The Irrationalist. Artist Kara Searcy: The book of John. Poet Jen Jabaily-Blackburn: Yes! Liz Glynn is a brilliant sculptor (see her work here). I’ve known her since we were 11 or 12—I think we met in a Latin class—and she also has a real fascination with the classics. A few years ago where she and a team made a model of Rome out of recycled cardboard and wood, then sacked the miniature city. Jon Defreest (he works under the name Jonny Etc.) is a childhood friend of my husband’s and a fantastic illustrator whose work usually responds to TV and the movies. His stuff’s clever as hell—I don’t think his brain ever turns off. Poet Jen Jabaily-Blackburn lives in the beautiful Pioneer Valley of Massachusetts with her husband and their dog. Most recently, her work has appeared in or is forthcoming in Hayden’s Ferry Review, Sugar House Review, and The Journal. She is an associate editor with Linebreak. Her haiku for Fall was featured in Broadsided’s Haiku Year-in-Review 2011.